Sometimes I’m just looking for inspiration on a Thursday afternoon. Today I found it by perusing The Art of the Menu, the newest member of the groovy design blog enterprise, Under Consideration. Devoted to “the underrated creativity of menus from around the world”, this site catalogs menu images and is a delight to behold. 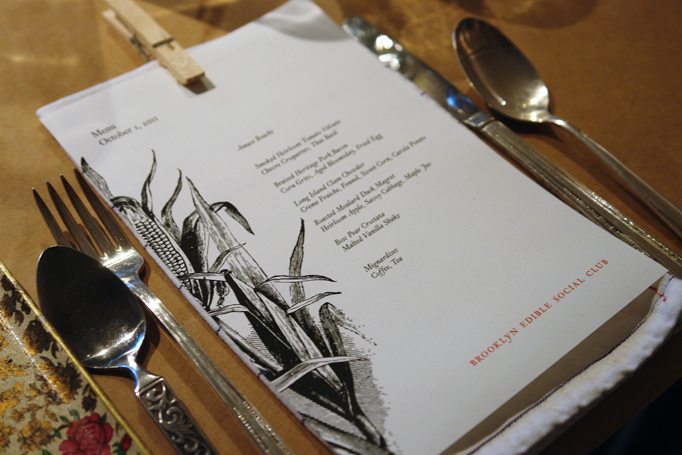 One of my favorites, Eleven Madison Park, is included as well as the beautiful menus produced by the Brooklyn Edible Social Club, where I had the good fortune to find myself dining in August. The beauty of this site isn’t just in the menus themselves, but in the way they are cataloging them into a searchable database (yes, I am a librarian). So if you like to geek out on typography and food, and love certain restaurants for their attention to this detail, you must pay them a visit. Even cooler is the fact that they welcome submissions, so if you have a restaurant you love for their menu (as well as their food), submit it to the site and participate in building one of the most delicious databases out there. This entry was posted on October 20, 2011, 4:04 pm and is filed under inspiration. You can follow any responses to this entry through RSS 2.0. You can leave a response, or trackback from your own site.